A vertically integrated watchmaker that makes its own dials and movements, Parmigiani Fleurier recently introduced the calibre PF517, the one of the slimmest self-winding tourbillon movement on the market. 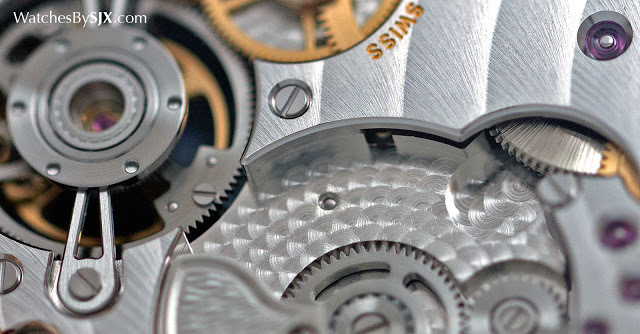 It’s found inside the Tonda 1950 Tourbillon, a watch as uncluttered as the movement is thin. At 40.2mm in diameter the case is not yet, but feels larger than it is, due to the thinness of the case, narrow bezel and plain dial. 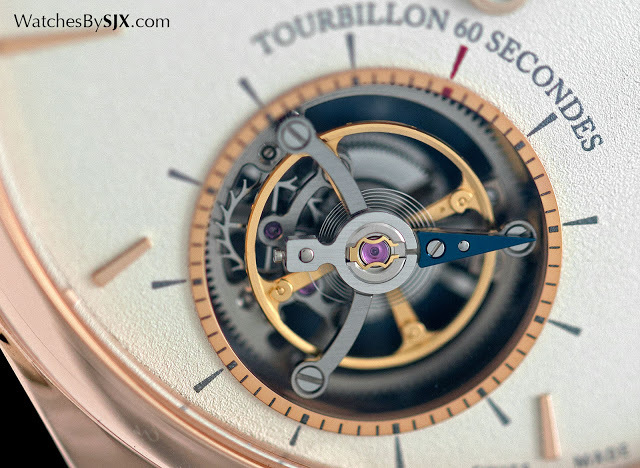 The dial is unadorned, with almost nothing superfluous except for lettering around the aperture for the tourbillon. 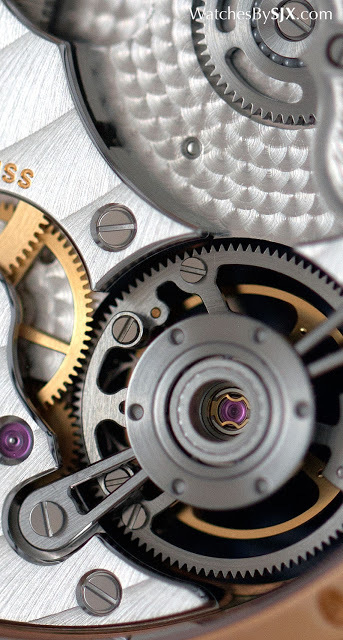 Because the dial is so clean, the eye is immediately drawn to the tourbillon. As expected for a movement this thin, the tourbillon is of the flying variety, instead of the more traditional sort with a bridge that requires more height. Another reason for its slimmest is the minimalist tourbillon cage that’s made of titanium and weighs just 0.255g, making it the lightest ever. Beyond the height reduction, a lighter tourbillon cage should improve timekeeping since it requires less energy to rotate, meaning more energy can be used to keep the balance wheel oscillating. The movement in the Tonda 1950 Tourbillon is based on the PF700 calibre found in the Parmigiani Tonda 1950, and also the Slim d’Hermes (which won the recent Grand Prix d’Horlogerie de Geneva). That’s the reason the tourbillon regulator is positioned at the unusual seven o’clock position, because in the base movement the balance wheel is in the same place (though Parmigiani tenuously explains the 7:08 placement as the time of Michel Parmigiani’s birth in the year 1950). Typical of Parmigiani movements the calibre is elegantly designed and constructed, with a platinum micro-rotor to help keep it thin. The finishing is also of a high standard, clean and nearly executed, though not quite as elaborate as the far more expensive tourbillons Parmigiani unveiled at SIHH 2015. 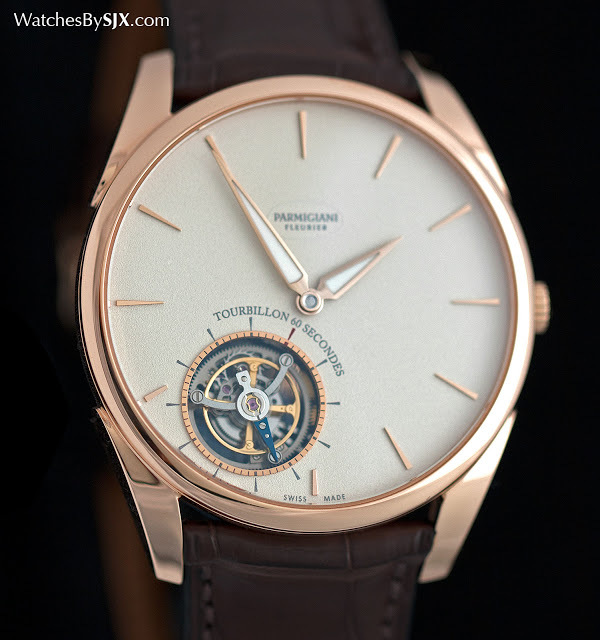 The Tonda 1950 is after all the entry-level tourbillon wristwatch from Parmigiani, priced about a quarter less than the next most expensive model. The Tonda 1950 Tourbillon is 8.65mm high in its entirety, thin enough that it’s bested only by one watch, the Breguet Tourbillon Extra-Plat 5377 that’s 7mm thick. But it’s not the thinnest automatic tourbillon ever, that distinction goes to the 4.8mm high Audemars Piguet tourbillon of 1986 that managed to be so thin only because the movement was built onto the case back of the watch. And it was also thin enough to be less than reliable. The Tonda 1950 Tourbillon is starts at US$130,000 or S$214,000 for the basic model in gold, fancier versions with semiprecious stone dials or diamond setting costs more. 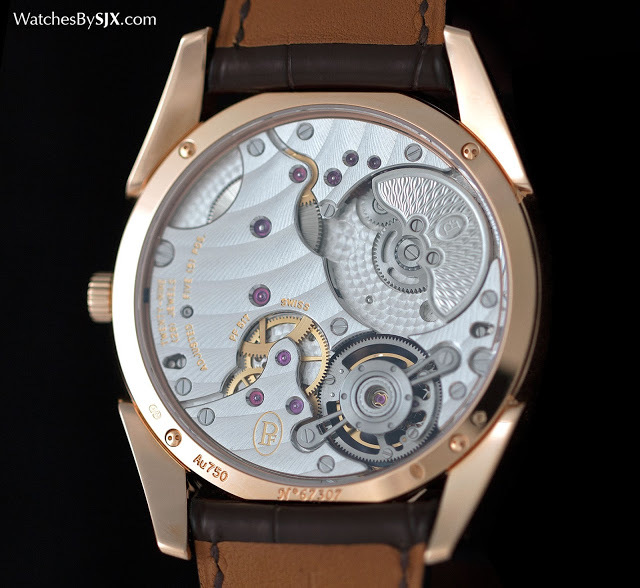 Correction November 3, 2015: The Tonda 1950 Tourbillon is not the thinnest self-winding tourbillon, that title goes to the Breguet reference 5377.